To strengthen your personal vitality and the reservoir of metaphysical powers you can command or control, through attunement to those inner and outer alchemical forces embedded into the archetypal tarot architecture. We often hear about using tarot for shadow work. This course takes that concept a step further to address how tarot and shadow work can be utilized to cultivate dynamic personal power. The more personal power you wield, the greater likelihood of success you’ll enjoy in achieving your goals. To break vicious cycles that hold you down and to overcome that which haunts you, you need force. You can summon that force from within you and to navigate that inner landscape of yours in search of your powers, we use the tarot. The power of change, or the power of esoteric knowledge, harnessed by attuning to Spirit. The tarot will be used as an anchoring and centering tool for navigating the inner landscape in search of those five reservoirs of power. We can also better understand these five powers of social psychology through the Major Arcana and the four suits of the Minor Arcana. We will cover both the psychological and the metaphysical facets of these powers and how you can activate them by navigating your shadow landscape with the tarot. Overcome lack mentality. the pain of failure, recurring underachievement, fear, inertia, and insecurity by activating these five powers that are just beyond the nether regions of your own mind and will. Tarot, social psychology, chakra strengthening, self-reflection, personal ritual, spell-crafting, and basic East Asian Qi energy work will be covered. The course content delves unabashedly into faith-based material. This course is suitable for tarot beginners. What I provide among the written materials for reference plus rudimentary look-up of card meanings on your own will suffice for working with the instructions in this course. Eastern Qi energy cultivation practices are explored, integrated with the tarot architecture, and the outline for ritualistic engagement with tarot is set forth for a thirteen-moon (or you can opt for a basic twelve-month calendar year) cycle. I’ve written a book for this course, Tarot and Shadow Work for Activating Dynamic Power, though it is not intended to be distributed to the public. It is a private manuscript for enrollees of the course only. It is intended to be kept confidential among the enrollees only. However, I will link you to a previews of the manuscript so you can catch a glimpse of its contents. The private guidebook will be your textbook for the course. You can preview the Table of Contents, Chapter 1 and Chapter 2 by clicking on the PDF links below. Or, if you’ve enrolled in the course and you’re a gunner, then go ahead and read these first two chapters so you start the session ahead of the curve. To help you navigate the course guidebook, there will be nine short videos that total a bit over one hour and under two hours for you to watch at your leisure. The videos are cut by topic so you can mix and match or skip around. My course, “Tarot and Shadow Work” will go live for access on June 21, 2017. After that date, you can log in and watch the pre-recorded videos and download the accompanying digital course guidebook any time. You’ll have access to the course materials for life, so revisit time and time again. There’s about 95 minutes of video run time that’s “required,” just meaning it’s the core content of the course. Those 95 minutes come from Videos 1, 2, 3, your option among 4 through 7 depending on which elemental power you’re cultivating, and then 8. Video 9 is optional because it’s more of a personal rambling. Run times for each video installment is provided below. Then there is a 370-page course guidebook that you can opt to read cover to cover during some moment of leisure, or just stay focused on the pages relevant to the power you’re cultivating. 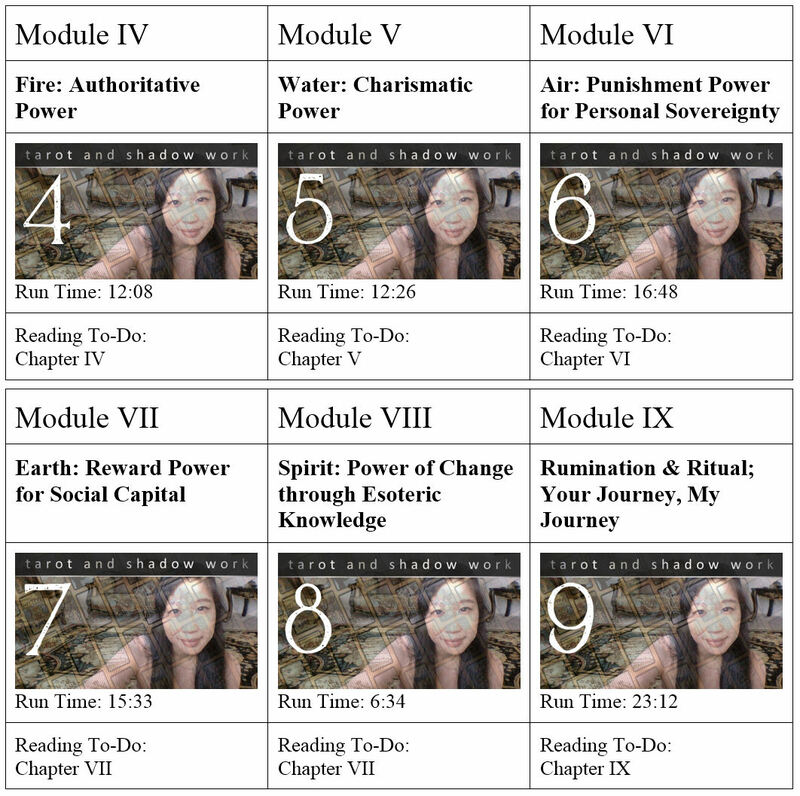 For example, if you’re seeking to cultivate the elemental power of Water, corresponding with the power of charisma, which you identified as the reservoir of power needed to overcome your current lack mentality, then after Modules I, II, and III, you might skip straight to Module V. You wouldn’t have to work through IV, VI, or VIII, since those videos relate to the other elemental powers. Then everybody would meet back at Video VIII on Spirit. Presuming you’re on some kind of intense roll and will be watching and reading everything, it’ll be about 2.5 hours of video run time total and presuming an average reading speed of 200 words per minute, then about 6 hours of reading material cover to cover. So basically, if you want, there’s enough busy work here to keep you occupied for a day. That being said, if you are serious about actually cultivating clear unobstructed access to the noted reservoir of power and make some measurable, documented changes in your life wielding that power, then this is not a one day thing, like, at all. You need to give it a minimum of one year (I’ve marked it as either a calendar year journey or thirteen-moon journey) where you reconvene with yourself once a month to “check in” and mark your own progress, self-audit, and reflect, and to the extent that you can, practice the Qi energy chakra strengthening power cultivation exercises on a daily basis. It only takes 60 seconds a day. Seriously. If you’re familiar with Tarot Summer School from last year, then you know there will be Campfire Sessions scheduled throughout the summer. Teachers and other students from around the world attend these online streaming video Q&A meet-ups where you get the chance to chat face to face with other enrollees and present your questions to the teachers. As I did last year, I try to make it into as many as I can. Tarot Summer School is a summer-long online tarot curriculum at the Tarot Readers Academy. This semester it consists of 15 tarot industry luminaries brought together by our lovely Headmistress Ethony. Summer 2016 was the school’s inaugural year, which I had the great privilege to be a part of, and after its great success, it’s back this year and back strong. I’m so excited myself to be taking these courses after my own course is done! See below for the full lineup along with the courses each instructor will be teaching, and also a link to their professional pages so you can read more about them. Commit to an extraordinary summer of tarot. Sign up for several of these courses a la carte or– and I recommend it– get the Season Pass for $199, which will get you access to all of the courses…for life. That’s right. You will get a login account and can access any of these courses any time. Ever. The instructor of this course is not a licensed counselor, therapist, or psychologist. This course is designed for general spiritual educational purposes only and not intended to diagnose or treat specific psychological issues. Course content is designed for individuals in ordinary mental and physical health. Wow, Thanks again for offering such deep course. Just finished looking over the links to your book. I am definitely sold on the value of what you’ve put together for this course, so vital for the times. Genuinely enthralled in using tarot, archetypes, etc this way. Thank you for the juicy shadow work prompts. I love the combination of eastern/western wisdom/methods. What an amazing course!